I’ve had the opportunity to program some legendary news/talk stations. At each of these stations I was blessed to work with legendary morning talent. 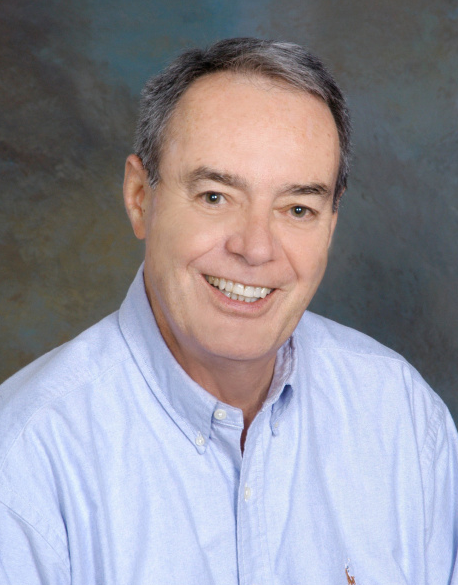 At 610WTVN in Columbus it was Bob Conners, who passed away on November 23rd at his home in Florida. I first met Bob in 1996. He was already well into his 60’s. Me? In my 30’s. 610WTVN was then, as I liked to describe it, a radio station needing to play “that Carly Simon” record just one more time. One day I broke it to the sales manager the station was a news/talk station and Carly’s CD’s were going into storage. His surprised response, “When did that happen?” “The day the station start airing Rush Limbaugh,” I said, which was before I got there. The audience was old and growing older by the minute. I asked Bob, “What was his goal?” He replied, “To be number one 25-54.” Looking at the then ratings it was a distant goal, but we started working on it. Once I said to Bob he needed to say his name more and with his driest of humor and deepest of voice jokingly responded, “Darryl. Everyone knows me.” It was about a new audience, however. A new audience we needed to make him number one. So the game began. Each morning he’d say to me or our Executive Producer Mary Jo Dilonardo, “I’ll bet I said my name 40 times.” We’d respond, “No. It was 3.” We were counting. It was a comical game as Bob, Mary Jo and I were dragging an aging radio station into a new era. And without letting on to others, Bob was engaged, because this was about his reinvention too. 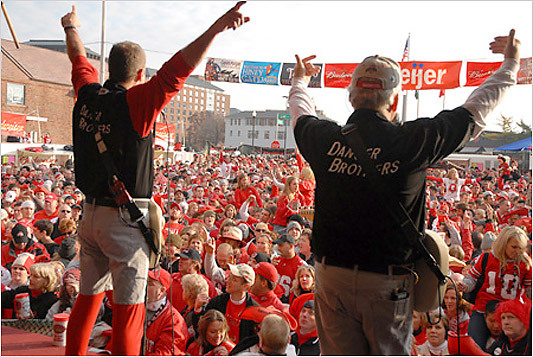 Back in those days, 610WTVN put on the biggest tailgate party before and after each Ohio State home football game. HineyGate took place in front of the old Holiday Inn on the Lane. It was massive drunk. About 15,000 people, of all ages, wandered in each Saturday and guzzled hundreds of kegs of beer. Bob reveled in this celebration that was all things “Buckeyes.” He’d get on stage, address the thousands and would command their inebriated attention. He was like a rock star to the crowd. He loved the Buckeyes and loved Columbus, his adopted home. HineyGate was a vehicle for Bob to reinvent himself. And he did, showing he was young at heart, displaying his pride for Columbus and how he could and did relate to the younger people he needed for the station. Bob was hip! When you cross paths with someone in life, there’s always a reason. You may not know it then, but years later you’ll discover the true reason for your association. Bob Conners taught me to never stop learning, adapting, reinventing. Bob knew, through his years of experience, things rarely stay the same. Change is a constant and to survive one must adapt and appeal to a new radio audience, as radio audiences are always in flux. About a year and a half after he and I start working together a ratings book came out and I ran the usual programmer’s reports, breaking out the dayparts and printing them off. Late that warm and sunny morning in central Ohio, I called up to Bob’s office two floors above mine and asked him to come down to my office. It was around 11am. As he walked in a few minutes later, I got up and shut the door. We both sat down at a small round conference table that was almost too big for the room. On the table was a single piece of paper, folded in half. I slid it across to him and said, “Congratulations.” He slowly picked up the paper and opened it. It was a ranker report that listed his show at the top of the ratings. Number one persons 25-54. He was slightly taken aback and somewhat speechless. His face displayed a look of accomplishment after another successful run at reinvention. 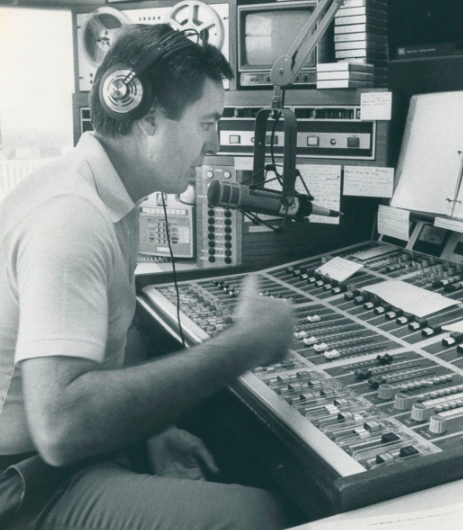 Bob Conners, BC, was a radio icon. He knew the secret to success. Change. Adaptation. Advocacy for his community. And a love of life. Bob, thank you for what you have taught me. You will always live in my heart and the hearts of the thousands you touched each morning with your deep, calming and resonate voice. You’re now at peace. God Bless. I can believe this story. Once I complained to the once a week early morning’s Gary Jeff Walker he was repeating his name and “700wlw” catchphrases in a juvenile manner and way too many times. letters and some associated catch phrase nonsense I can’t quote exactly here. If it had been Krogers, Parks would have had tuna cans falling on anybody who took a mushroom soup off the aisle. well said, daryl. I remember one sunday, I was doing news. we were in the old buckeye federal building on gay street downtown. BC comes in…I think he was finishing up a project he was working on. don’t remember what it was. at any rate, we meet each other in the hallway and I say to him, “yo BC, what’s up?” he says, “you are. you’ve got your finger on the pulse of about half a million people in this city.” for him to say that to me…a wet behind the ears kid straight out of otterbein college, even though I already had 4-5 years of professional radio under my belt…meant 2 things. 1, he made you feel like you were part of the team. 2, he wanted you to understand that it was up to you to make sure people were told what they needed to know, when they needed to know it. it wasn’t conceited or arrogant or prideful in any way. he was glad you were there, and you felt like you wanted to be there. he was common as an old shoe and as comfortable as a favorite pair of blue jeans. thanks, BC. now I’m off to sammy’s ever popular bar and grille and raise a toast to the morning monarch…. Bob was not only hip, he remained relevant. Few people can do that for almost 45+ years in the same market. Bob was not only hip, he was relevant. Few people can do that for 45+ years in the same market and mostly on the same station. Thank you for this column. I really needed to read it.